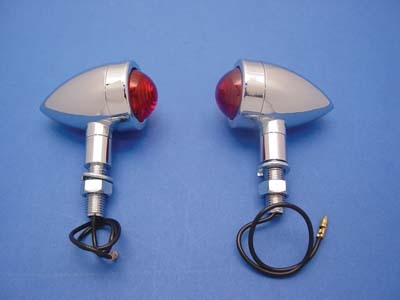 Chrome mini speeder bullet lamp set with 12 volt 23 watt clear bulbs with red lenses, single filament. Includes a 3/8"-24 mounting stud. **NOTE: For show or decorative use only and is NOT D.O.T. approved.